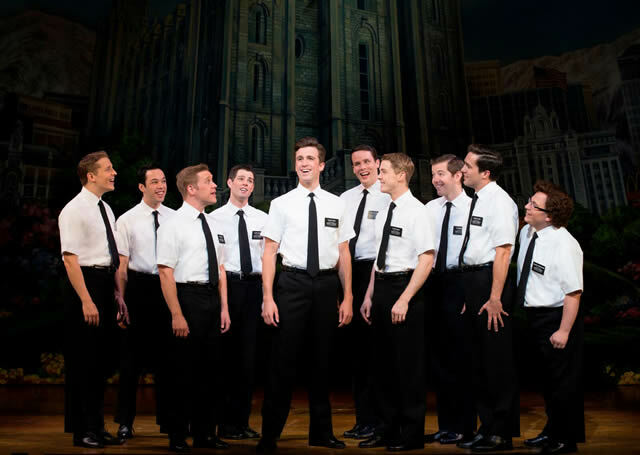 There is no denying that brand Mormon is an unstoppable force and has quickly established itself as the coolest “must see” musical in town (I mean even flipping Prince Harry has graced the Elders with his presence!) Around 14 months have passed since I saw the performance on it’s electric opening night in February 2013 and it seems the buzz surrounding this show is just as strong; the house is full night after night and the performances are met with rapturous applause. Those who have yet to secure a ticket to the show regularly ask me “is it worth it?” My answer is a resounding yes. Written by South Park duo Trey Parker and Matt Stone alongside Avenue Q’s Robert Lopez, the show was always going to be somewhat cheeky and foul-mouthed as the trio poke “loving fun” at the Mormons. Immediately one is aware that this is not exactly a musical to take your Nanna to. However this in itself is a fantastic marketing tool as the show effervesces a “cool” appeal that captures a young audience where other theatre shows struggle. Anything that widens the demographic of theatre goers is a good thing in my opinion. As many will by now know, The Book of Mormon is the tale of two Mormon Missionaries on a holy trip to Uganda which turns out to actually be NOTHING like The Lion King. What many may NOT know is that despite the “bad” language in all round ridicule, the show tells a meaningful story with a heartfelt moral at its core. Despite being a seemingly unconventional musical in the less than high brow approach to its subject matter, The Book of Mormon is actually a fantastically executed and surprisingly traditional book musical. Nicely acted dramatic scenes are developed and heightened with large scale and melodically memorable musical numbers. Success! Roof raising numbers such as "Hasa Diga Eebowai," "I Believe," and "Spooky Mormon Hell Dream" have stuck in my mind for months and I have often said memorable music is KEY to lasting success. I have no idea how the Laurence Olivier Award committee was able to choose between leads Creel and Gertner for the Best Actor in a Musical Award as they are both utterly fantastic. Similarly Alexia Khadime as Nabulungi (or NICKI MANAJ as Cunningham mistakenly dubs her!) presents herself as the shining star of Uganda! I really could sing the praises of each cast member all day, but best you just go and see them do what they do best for yourselves! The one truly irksome issue with this show (that, I hasten to add, does not effect its star rating) is its price banding. For a production that appeals mainly to the younger generation but charges cira £150 (!) a top price ticket, I am a somewhat saddened. Nonetheless a cheaper option can be found in the Dress Circle where a lucky few can grab a ticket for around £40, however advance booking is 100% necessary. Alternatively one can enter the “Mormon Lottery” for the chance to get a ticket for £20 which is a good idea assuming you haven’t won the ACTUAL lottery.